This particular one comes with all the bells and whistles: the pot is non-stick (which comes in handy to wash off the rice), it has several modes including porridge (congee/zhou), soup, and several different types of rice (white, sushi, glutinous, and brown). And it has a timer. And (this is the part that appeals to my inner geek), it has artificial intelligence. Specifically, what the makers call Fuzzy Logics , which allow it to handle more complicated scenarios than the one where the user has put in the correct amount of rice and the correct amount of water. As this article has it, the cooker is starting to think like a real cook, adapting its behaviour to what’s happening inside the machine. Typically, if the rice gets dry too fast, it’ll adjust the temperature downwards; if there’s too much water, it’ll boil it away, etc. I had no idea those things could get so complicated . But when you think about it, it does make sense–adjust for the fact that rice is the staple food of Asia, and of course Asian households are going to have complex rice cookers, just as we have fairly complex coffee-makers. 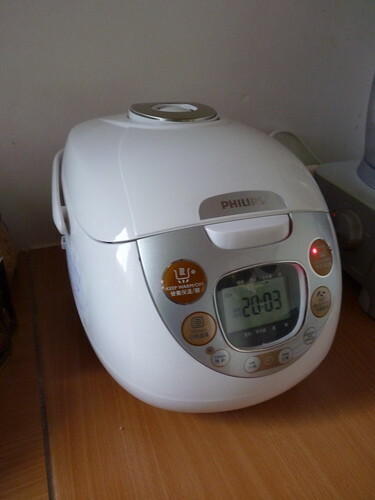 Take the timer function: when your morning meal is steamed rice or congee (as it is in China or in Japan), which takes at least 30 minutes to cook up (in the most optimistic of setups), then sure, the timer function means a little extra time in bed, or in the shower, or elsewhere. The different types of rice? This is the traditional method for cooking glutinous rice in South-East Asia, which requires a special bamboo steamer–and the least that can be said is that it takes up quite a bit of space (to say nothing of practical requirements. It’s a bit of a challenge to get the cooking time right with this contraption). There’s a fascinating article here, which charts the development of rice cookers, and their use in households. (I did wonder why the Japanese were such big players in terms of rice cookers, and it turns out that they use a very particular variety of rice that is fairly glutinous–making for a particularly difficult stovetop cooking. Jasmine rice, the staple food in the Indochinese peninsula, is fairly easy to cook on a stove, if you pay enough attention. Apparently, Japanese rice is a little bit more of a challenge). If you’re cooking your rice European-style, by flinging a few handfuls of it into a large pot of boiling water, then you won’t know what I’m talking about. Asian rice is cooked by absorption of the water into the rice–it’s fluffy and tasty, quite unlike the odorless white goo that comes out of a European pot. 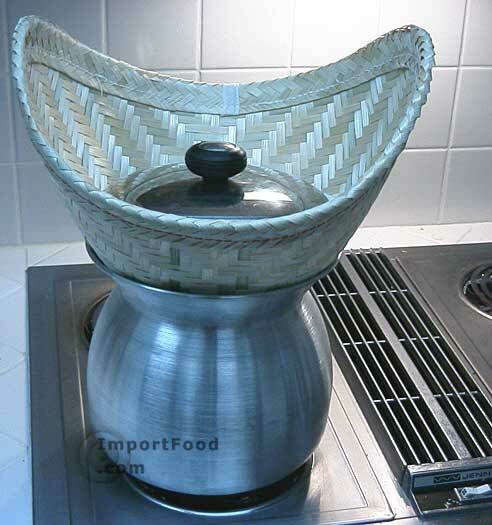 My only experience of Asian rice cookers was in Vietnam, where the ones I saw tended to look more like this, somewhat less modern (not surprising: Vietnam is developing pretty fast, but it’s not yet a First World nation, and the people I saw weren’t madly wealthy either). Aliette de Bodard is a Computer Engineer who lives and works in France. When not wrestling with Artificial Intelligence problems (aka teaching computers how to analyse what they see), she writes speculative fiction. She is the author of the Aztec fantasy Servant of the Underworld from Angry Robot, and has had short fiction published in Asimov’s, Interzone and the Year’s Best Science Fiction. 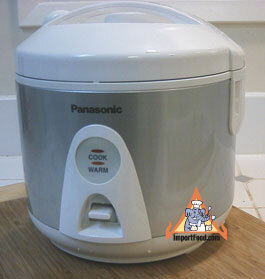 I live in Vancouver and thought everyone had a rice cooker! I’ve been using mine for years, though mine is of the dumb variety. I’m going to purchase a “magic pot” soon, which is a super cool thermal cooker.